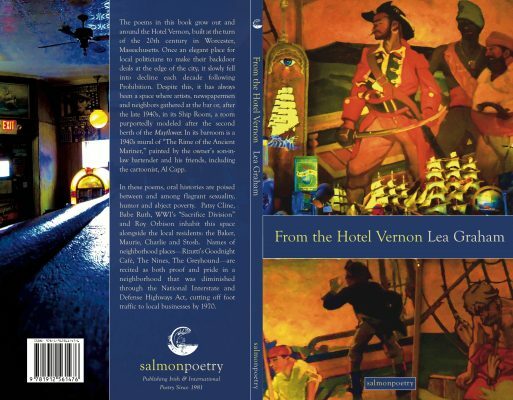 The poems in this book grow out and around the Hotel Vernon, built at the turn of the 20th century in Worcester, Massachusetts. Once an elegant place for local politicians to make their backdoor deals at the edge of the city, it slowly fell into decline each decade following Prohibition. Despite this, it has always been a space where artists, newspapermen and neighbors gathered at the bar or, after the late 1940s, in its Ship Room, a room purportedly modeled after the second berth of the Mayflower. In its barroom is a 1940s mural of “The Rime of the Ancient Mariner,” painted by the owner’s son-in-law bartender and his friends, including the cartoonist, Al Capp. In this manuscript, oral histories are poised between and among flagrant sexuality, humor and abject poverty. Patsy Cline, Babe Ruth, WWI’s “Sacrifice Division” and Roy Orbison inhabit this space alongside the local residents: the Baker, Maurie, Charlie and Stosh. Names of neighborhood places—Rizutti’s Goodnight Café, The Nines, The Greyhound— are recited as both proof and pride in a neighborhood that was diminished through the U.S. National Interstate and Defense Highways Act, cutting off foot traffic to local businesses by 1970. Lea Graham’s work includes the chapbooks, Spell to Spell (above/ground press, 2018), This End of the World: Notes to Robert Kroetsch (Apt. 9 Press, 2016), Calendar Girls (above /ground press, 2006), and the poetry book, Hough & Helix & Where & Here & You, You, You (No Tell Books, 2011). Her poems, translations and reviews have been published in Red Wheelbarrow, Crab Creek Review, Bateau, Notre Dame Review and Southern Humanities Review. She is the winner of the Literal Latte Poetry Contest for 2018. Graham is an Associate Professor of English at Marist College in Poughkeepsie, New York and a native of Northwest Arkansas. The groom is a mapmaker. No dancing except for the toddlers. They tell me later: Oh we’re wild.